Create a work station with all your office supplies in one place with the Amish Office Armoire Desk. 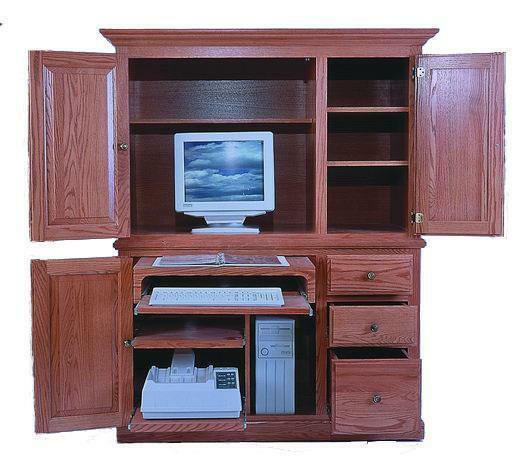 This convenient all-in-one workstation can go in any room of your house and be closed up when not in use. When you are ready to work, simply open the doors and have access to your computer, keyboard, printer, CPU Tower, and a variety of drawers and shelves to organize your work essentials for maximum productivity. Get your order started today and enjoy the benefits of this beautifully crafted and functional Office Armoire Desk. The cabinet is in two pieces. Backside is 1/4" plywood - stained to match the rest of the piece with a rough top coat applied. All items were received today! The furniture is beautiful! I love it!